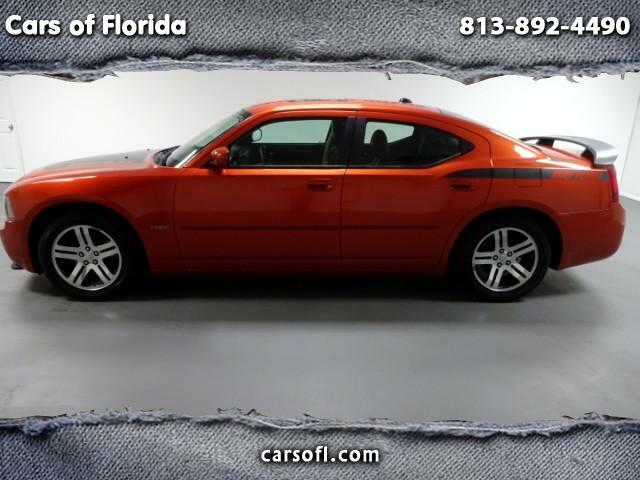 Cars of Florida is proud to present this 2006 Dodge Charger R/T MANGO ORANGE DAYTONA! This exceptional vehicle is a rare find! 5.7L HEMI with suede leather accents and much more! Two tone combo with Gray Matte "DAYTONA" wrap which includes the spoiler. YOU WILL NOT FIND THIS ONE AGAIN THIS FLAWLESS! NO ACCIDENTS! Full mechanical inspection completed, sunroof, GO MANGO EDITION 2209 out of only 4000 made! Carfax attached reveals an exceptional service history, ownership and only two original owners. Includes two remote keys and fobs with books & manuals. First one to see it will take it home! Collector's DREAM! Priced to move! BEST PRICES IN THE REGION!! Visit us online on our state of the art website or come in person to our gorgeous 40 car in door air conditioned facility and fall in love with this vehicle or the rest of our hand picked fleet!